New themed ares on NCL's upcoming cruise ship the Norwegian Getaway. Norwegian Cruise Lines upcoming ship the Norwegian Getaway is to debut several bars and restaurants to the South Florida and Miami style. The lounges will offer a sunny tropical feeling just like Miami and the state of Florida. The ship will be based out of Miami so is a perfect fit and a good way to continue the bright tropical vibe. The lounges which are Tropicana room, Flamingo bar and grill, sunset bar and Sugarcane Mojito bar are all set to bring the themes Miami and Florida onboard the Norwegian Getaway. The Tropicana room will be a dining area at the aft of the ship on deck 7. The lounge is inspired by all the glitz and glamour of the Miami beach night life. It won’t just be todays night life but from the 1940s and 50s. The decor will also match the theme with rich and dark colors. The menu will also feature Latin dishes which are popular in Miami. The Flamingo bar and grill will be a complementary dining lounge located on deck 16. In the day it will offer guests a Latin environment along with Latin and traditional dishes. passengers can also enjoy different types of drinks to match the theme including Cuban style coffee. Sugarcane Mojito bar will feature all sorts of tropical drinks along with Mojitos which are of course very popular in South Florida and Miami. 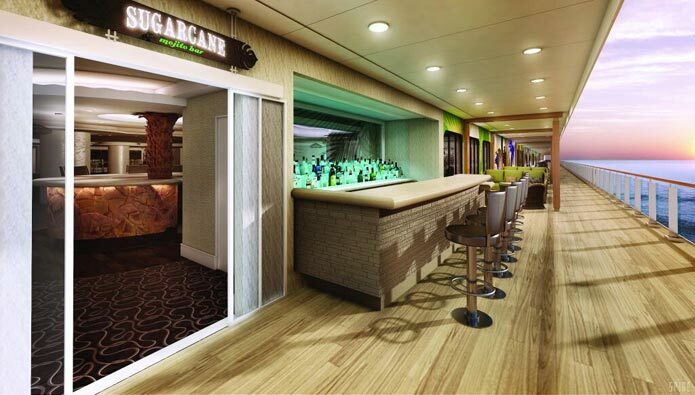 The bar will be located on deck 8 and will be inside with spaces outside too. Expect to see an Island theme with leaves, and relaxing areas to sit. Sunset bar will be located on deck 8 and will have a Key West and Ernest Hemingway style theme. Now when you think of Key West you think of bright textured effects, rum and of course cigars, well that’s what the bar will offer. There will also be a large Marlin mounted behind the bar which also is typical of Key West. It’s not just the lounges which will be themed, the entire ships decor will showcase all sorts of different artworks of many popular places in South Florida. Norwegian Getaway will be the second on the Breakaway class ships and will launch in 2014 at 146,600 tons. At the moment the ship is under construction in Papenburg, Germany. Just typing about all the bright tropical spaces that Norwegian getaway will have put a smile on my face and gets me thinking of lush beaches with tropical drinks and Latin food. When can I book!! What do you think of the Norwegian Getaway and does the theme make you want to cruise? Let us know in the comments below.